Steven, aka Steven's Sazerac, is a good-looking 4-year-old white and brindle male born April 26, 2003. 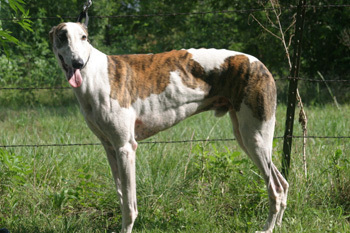 His sire is the late famous Gable Dodge, making his grand-sire Wigwam Wag, and his dam is Secret Splendor. 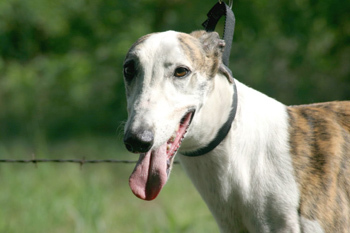 Steven and Indy are half brothers sharing the same sire, Gable Dodge, who is sire to many other GALT greyhounds. Steven has 144 races to his career, all at the Corpus Christi track, starting October 14, 2005, and ending May 12, 2007. Steven's owner said it was time for him to enjoy his retirement, so here he is - looking for his forever home. Steven passed his cat test and got to enjoy a nice afternoon play date as a result. He took a brief sniff of the cat, Carbon, at first meeting, then hung his head low and just stood there. Carbon leaned over and sniffed the top of Steven's head. Next Steven met Slate, the other young cat, who was walking and stretching on the floor with no interest. Later, after a trip to the litter box, Slate was "free and clear" for some high-speed action around the house. Steven witnessed this and just stood and watched. Later, after a couple of hours in the house, more comfortable in his surroundings, and tail wagging, Steven took another opportunity to get a longer sniff of Carbon. Carbon was comfortable with him, too. The other dogs were swirling around in the immediate vicinity paying no attention to the cat, so maybe Steven got the cue that this critter just wasn't an issue. Steven is, therefore, now said to be "cat tolerant." He is also small dog tolerant.